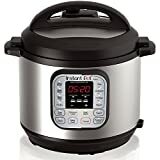 The Instant Pot DUO60 6 Qt 7-in-1 Multi-Use Programmable Pressure Cooker went on sale last week in an early Black Friday deal, and thousands of our readers managed to grab one before the deal sold out. Sadly, many more people wanted in on the action, and several people emailed us asking to make sure we let everyone know when this insanely popular model is back on sale at a discount. Well, bargain hunters, it’s go time! The Duo60 is discounted once again on Amazon, and there’s no telling how long supplies will last. Grab one while you can.